Sophia, a young girl, suffers many of the plights an adolescent girl sustains. With an emotionally distant mother, a step-father that rules with an iron fist and step brothers that think she’s invisible half the time, her only saving grace is her brother Raymond. It seems the only way to abandon the strife of a broken home and for a kid to be a kid is in her chosen sanctuary of Albion Falls. Unbeknownst to her parents she’d often tag along with Raymond and his best friend Liam for surrogate comfort, relaxation and one adventure after another. Enter Alba. On the surface Alba is just another mischievous young girl who befriends Sophia when she needs it most. Something is most extraordinary about Alba. It seems only Sophia is able to see her and is privy to all of the magical enticement that comes along with her. A self-professed Fairy, Alba soon educates her new friend on the ways of supernatural entities and their ways of life. After Alba becomes mysteriously estranged, something most unexpected and equally bizarre transpires. Roger, her step father, is suddenly kind to her, almost human. Aldo, a boy from her high school, jock extraordinaire and youth socialite ‘A’ lister, has suddenly become immensely interested, staking her as his chosen mate. Everyone who associates with Aldo is loyal, close knitted and devoted seemingly until the bitter end. Will Sophia’s estranged special friend Alba be the key to unfolding the mysteries of Aldo and company or is there something far more sinister behind the layers in Secrets of Albion Falls. One of the greatest rewards as a contributing writer, aside from the obvious opportunities to engage in some phenomenal adventures in literature, cinematic experience and convention coverage, is being witness to an artist evolving and recognizing their true potential. This past August I was fortunate enough to sit in on the Independent Writers panel discussion as part of the annual Toronto Comic-Con. The forum was easily the most rewarding experience of the entire weekend. After grappling with endless line ups, crowds and poor organization this was a most unexpected treat. A handful of Canadian authors discussed their experiences in writing, recognition and publishing. The spectacle was a must see for any aspiring author. I was most moved with one author in particular, one Sass Cadeaux. Extremely humble, reserved and a little on the quiet side something remained most intriguing about this artist. 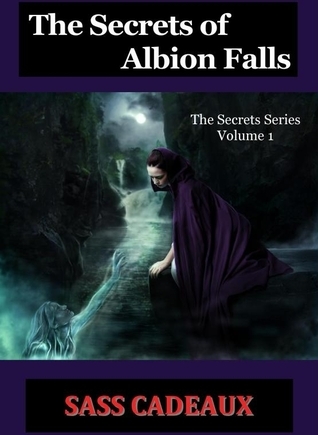 After sharing a number of strategies, techniques and brainstorms about getting creative writing out there, this author passed out an excerpt of a work in progress, simply titled The Secrets of Albion Falls. Although the pamphlet contained a mere fifty pages or so it was just the right dose of captivation and enchantment to whet the appetite for explorers of paranormal adventure. After contacting the author in a near state of frenzied suspense, I attempted to rationally demand the balance of this spell binding tale. I had managed to succeed in one front at least in receiving some additional collected endeavors titled The Coalition of The Supernatural. The jury remains out on if I had appeared raving like a lunatic with irrational demands. That being said, I rather enjoyed The Coalition of The Supernatural as a previous review will indicate in the archives here. Granted, the tale was a little rough around the edges in certain areas as a matter of individual opinion. It took almost seven months to plunge the recesses of my eager mind deep into the complete version of The Secrets of Albion Falls. The vivid imagery depicted is nothing shy of extraordinary. It takes virtually no time at all for the reader to become not only engrossed and invested within the tale, but a sensation of being an actual part of the scenery cannot be denied. Character development is flawless, indicative of a contemporary society in which traditional families are simply a thing of the past. We relate and translate the protagonists into a personal piece of ourselves and we boldly venture further into how the story unfolds. The interpersonal relationships that exist within are designed with such finesse, we have to ponder if perhaps this author is telling a great deal from personal experience to illustrate the communication so effectively. Inner emotion, turmoil and reflection is described effectively from Sophia’s point of view. Cadeaux truly shines in first person persona writing, bringing a myriad of cognititions, feelings and perceptions to life. The author has truly fine-tuned her sense of subtlety in laying clues and innuendo surrounding Aldo and company’s unusual ways. Just when we’re expecting the story to take one direction, it takes a most unexpected detour much to the delight of cynical and novice readers alike. There seems to be an exorbitant duration in plot development when Alba disappears for the climax to come until full flourish. Yet it’s a justifiable evil in this case and will disappoint few. My only irrational gripe as of now-when is the sequel coming? Sass Cadeaux is one of the best, natural storytellers I have ever enjoyed reading. As indicated in this blog, the superb writing allows readers to fully engage with characters that feel real and a strange, yet normal, world in which the tale unfolds. The ending comes with the same gentle subtly as a pile of fine China dropped from atop a step stool onto a tile floor…it IS a shock! And, it is the RIGHT ending, one I longed for throughout the book. As Mr. Thompson states, the sequel cannot arrive soon enough!